RH Petrogas Limited, an investment holding company, engages in the exploration, development, and production of oil and gas resources in Indonesia, the People’s Republic of China, Singapore, and Malaysia. The company develops and produces hydrocarbon resources in Fuyu 1 block covering an area of approximately 254.9 square kilometers located in the Songliao Basin, Jilin province, the People’s Republic of China. It also holds a 60% interest in the basin production sharing contract (PSC), and a 33.2% interest in the Island PSC, which are contiguous blocks located in the Birds Head area of West Papua, Indonesia covering an area of approximately 2,000 square kilometers onshore and offshore; and a 51.0% interest in the SK331 Onshore Sarawak block located in the Balingian Basin through PSC. The company was formerly known as T8ri-M Technologies Singapore Limited and changed its name to RH Petrogas Limited in November 2009. 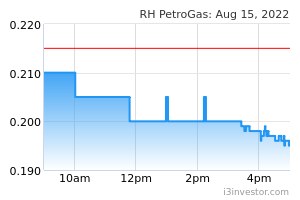 RH Petrogas Limited was incorporated in 1987 and is headquartered in Singapore. jeffthen Any news on why the company on trading halt today? prc4wifefe Heard about Malaysian spas o&g gonna buy some stakes....is it true....did u see any uob.-kayhian analyst report on this? jeffthen Can you post it on here to share??? Thanks! ....any rumours in spore why trading halt? prc4wifefe this one i know...any idea who are d investors?? rubisa57 buy on rumours sell on news. ninabucb how u guys think of RH PETROGAS?? on monday?? will it shoot up?? jeffthen But then if sona buy in 10% is not really a good news to push up their stock but is good for RH Petrogas right? inphyy Hmmmm...drop faster than rising.Yesterday dipped -21% wondering why SGX no question? inphyy Yesterday vested.Today can get the same price bought. Look like babysitting for a while. alexyap any fundamental in this stock? The Placement Shares will be listed and quoted on the Official List of the SGX-ST with effect from 9.00 a.m., 17 October 2013.
inphyy Yeee...early me saw a posted about "good news?" ...deleted? Well that alright. News reach public already too late. Previous my comment are base on TA. The chart show uptrend. 0.81 still my resistance price. adc38 big volume recently, anyone know what happen? Skye15 Can pick up some counters now since there is good news for oil found? How risky is this counter? OSK recommended BUY. Any advice? ticktock commenced drilling of the Koi-2 appraisal well (“Koi-2”) on 29 November 2013 using the Bohai-8 jack- up rig in the offshore area of the Salawati Kepala Burung PSC (“Island PSC”), West Papua, Indonesia. It is anticipated that drilling of the well will take approximately 21 days. results soon? Positive or negative? dicklinglk Hear nothing as yet ..... TP is 1.38 ??? mmfsolutionsg Yes, news update us. RH Petrogas Limited (the Company) reported that the Plan of Development (POD) for the North Klalin gas and condensate field in the Kepala Burung Production Sharing Contract (Basin PSC), West Papua, Indonesia, has been approved by SKK Migas (Satuan Kerja Khusus Minyak dan Gas). The POD was submitted following the discovery made by the North Klalin-1 well in 2011 and the successful appraisal by the North Klalin- 2 and 3 wells in subsequent years. North Klalin-1, 2 and 3 wells have since been put on production. The POD program involves the drilling of four new development wells and the construction of flowlines tying back to existing production facilities within the Basin block. The additional gas production from the North Klalin field will be used to supplement internal fuel requirement for operation as well as to meet additional demand for gas in the local markets and to support the economic development around the Sorong area in West Papua. The Company through its subsidiaries Petrogas (Basin) Limited and RHP Salawati Basin B.V. has an aggregate 60 percent working interest in the Basin PSC. The other partners are PetroChina International (Bermuda) Ltd. (30 percent) and PT Pertamina Hulu Energi (10 percent). The consortium, as contractor of Indonesian government operating under the supervision of SKK Migas, has actively explored and produced oil and gas in the working area.